If only littleBits was around when I was a kid (which wasn’t that long ago by the way!). LittleBits is an opensource library of electronics modules that snap together with tiny magnets for prototyping and play. You simply connect the littleBits and away you go. Each littleBit has its own magnet and will only connect with the corresponding circuit board – all logic is pre-integrated and it’s easy to find ideas on what circuits and projects you can create. Just playing around with littleBits is really a lot of fun. Once you get the hang of it, you can create and integrate littleBits into anything really! 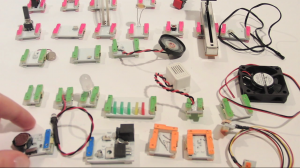 LittleBits allows kids, parents too, to become electronics engineers in hours. Highly Recommend! Click here for more info. Great Idea, better than watching a IPhone screen or spending your life on Facebook!